As I tuned in on Saturday night in anticipation of the first episode of the new series of The X-Factor, what struck me was the appearance of new interstitials (momentary inserts placed during ad breaks) announcing ‘I Love Saturdays’ in pink shades against a dark black background. On the one hand, the appearance of these interstitials could be viewed as nothing new. They do, after all, exemplify industrial practices concerning branding and zoning that are now well-established within the TV industry. Branding is widely recognised as a highly necessary practice in television nowadays. As channel choice has increased, and the cumulative TV audience has fragmented across the different services and modes of reception that are now available (such as iPads, smart phones etc. ), there is an accepted need for all stations to construct and communicate distinct brand identities as a way of building a relationship between channel and audience. The main ITV channel demonstrates this well as, in January of this year, it underwent a major rebranding exercise which involved the introduction of new idents (the small inserts that come before the start of a new programme) and a redesigned ITV logo which employs a ‘colour picking’ function that allows it to adapt to the tonal variations of its programming. Just before Saturday’s episode of The X-Factor there was, for example, an extended trailer for the new series of Downton Abbey which culminated in a long shot of the drama’s titular stately home over which the ITV logo skilfully adopted the colours of the location onscreen. In this instance, Downton Abbey became symbolic of ITV and vice versa. At the same time, constructing specific ‘zones’ of programming within the overall flow of a channel’s output is also a now-established industrial strategy. As Faye Woods explores with regard to Channel 4’s youth-orientated T4 strand that ran between 1998 and 2012, zoning is a useful practice as it allows channels to construct a distinct identity for parts of the overall schedule. These zones will then attract specific returning (and commercially-salient) target audiences irrespective of changes to the individual programmes that occupy these scheduling positions. Through inserting interstitials proclaiming ‘I Love Saturdays’ into its flow of programming, ITV is therefore only following established trends by attempting to construct an identity for its Saturday evening output and use this branded zone as a way of targeting specific viewers to ensure that they return to the channel on a weekly basis. However, what is interesting is that this new ‘I Love Saturdays’ zone seems to construct its understanding of the ‘mainstream’ audience in highly gendered terms. This is because shades of pink are used repeatedly for both the interstitials and appearances of the ‘colour picking’ ITV logo. ITV’s use of colour here is interesting for two reasons: firstly, it suggests the differences between understandings of a ‘mainstream’ Saturday evening audience between ITV and its main competitor, BBC One, at present. As Catherine Johnson’s work on Saturday evening BBC One programming makes clear, this part of the schedule continues to be associated with ‘family’ appeal as children are allowed to stay up later due to the lack of school the following day. As such, Saturday evening BBC One programmes such as Doctor Who, Merlin and Strictly Come Dancing are institutionally-required to attract a coalition audience of multiple ages, genders and ethnicities if they are to be internally-evaluated as successful. However, through branding its ‘I Love Saturdays’ schedules via multiple hues of pink, ITV appears to be suggesting that a ‘mainstream’ audience within a commercially-funded context means prioritising culturally-feminised audience tastes. In other words, a ‘mainstream’ Saturday evening audience for ITV is being imagined as primarily appealing to traditional discourses of femininity (as well as audience groups who may appropriate this discourse). The value of ‘the pink pound’, however this is understood, therefore seems to be being prioritised within the context of ‘mainstream’ commercial television at present. Secondly, rather than envisaging its culturally-feminised ‘mainstream’ audience as a monolithic entity, the multiple shades of pink employed by appearances of the ITV logo during ad breaks for The X-Factor works to strategically recognise the potential diversity of this imagined audience. As Veronika Koller’s fascinating social semiotic study of uses of the colour pink in different contexts outlines, pink can generate multiple meanings according to the shade that is used. For example, whilst lighter/pastel shades can suggest innocence and appeals to childhood, darker and/or bolder inflections have been appropriated by older groups of women as a sign of confidence and ‘girliness’ (although this meaning has been contested by others). 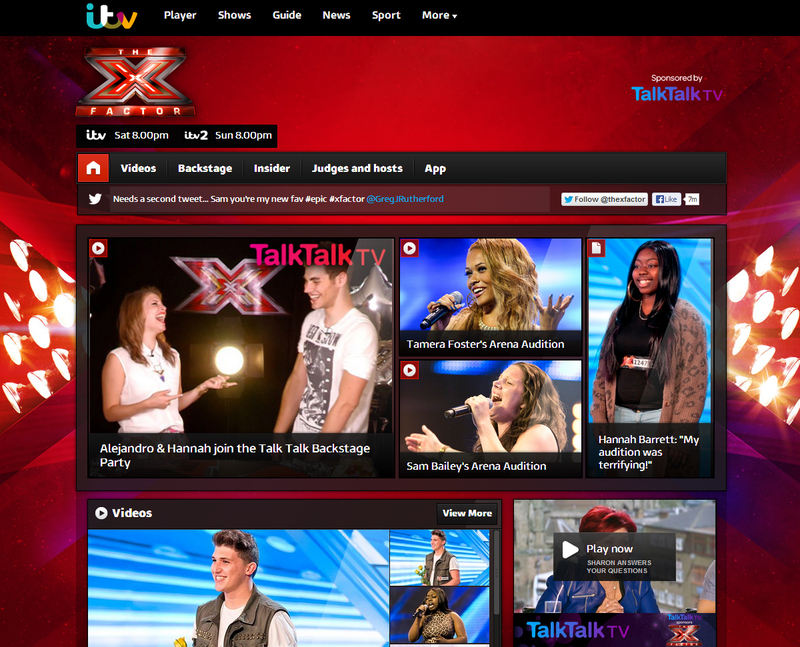 By uniting multiple hues of pink in its logo and interstitials, ITV is communicating that its Saturday evening programming zone, such as The X-Factor, new dancing series Stepping Out and the re-imagined Through the Keyhole, provides a self-contained area where gendered audiences can find a range of programming that will address their needs. Of course, this construction of ‘mainstream’ femininity opens up wider political questions concerning its potential exclusions. Nevertheless, it does suggest that, if pink is a colour you identify with, Saturday night on ITV is now for you.